Earlier this month, a group of our students and coaches travelled to the luxurious city of Marbella in sunny Spain, for the Trading Retreat! 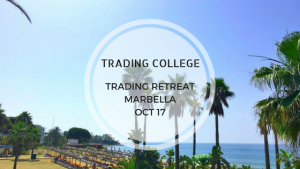 Our Trading Retreat is a chance for students and coaches to get together and spend a few days immersed in trading from live trading to trading discussions. This was a chance for our students to get a taste of the trader’s lifestyle in the sunshine and wealthy town of Puerto Banus. We spoke to trading coach Federico Bustos about his time on this month’s retreat. Welcome back Fed, hope you had a lovely time in Marbella? It was great! The retreat was amazing because we had great weather, great trading, and great company! We managed to balance trading with enjoying the sunny weather and each other’s company. Trading the markets in the sunshine is the dream! What was a typical day like at the retreat? We always started our day with a buffet breakfast at the H10 Andalucia where the retreat was held. At around 10 am (early for some people! ), we got ready to trade the markets. We traded for two hours until midday, remember that Spain is one hour ahead of us and we always run our live trading room from 9 am to 11 am (BST) so that’s why we traded at 10 am local time. At midday, we took a break for 3 hours. 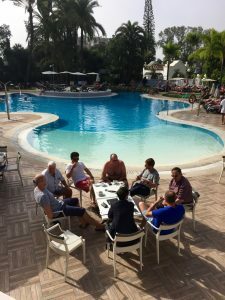 Lee, myself and the students enjoyed lunch by the pool in the sunshine, chit chatting and discussing trades and setups from that morning’s live trading session. The break also gave us enough time to have some 1:1 private mentoring sessions with some of the students. We resumed live trading at around 3 pm to trade the US session; trading for two hours and finishing around 5 pm. Once the day of trading was over, everybody would go back to the poolside to enjoy the sunset, while having some tapas and snacks, and maybe the occasional beer! Everyone sat back and relaxed after a successful day of trading. In the late evening, we all went out for dinner together. It was a great way to get to know the students and find out why they wanted to come to the retreat. We talked about their trading goals for the retreat and our trades and setups from the afternoon session. Each day was packed full of trading, but equally, we spent time relaxing and enjoying our beautiful surroundings in Marbella. 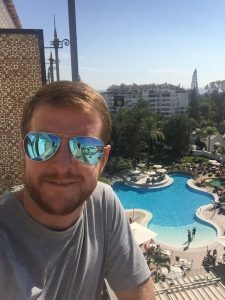 I was pretty busy teaching students and running 1:1 sessions but I did manage to have some free time to explore Marbella and the city. I visited the Old Town which was beautiful and visited Puerto Banus Marina. It’s a different world there – all you see is huge, luxurious yachts and things you don’t see anywhere else in the world. It was certainly a taste of the rich lifestyle, that’s for sure! What was the aim of the retreat? The main aim for most students was to gain an insight into the routine of a professional trader. They could see how easily they could fit trading the markets into their lifestyle. They got to see a taste of the good life; the trader’s lifestyle. We wanted to show the students that it is possible to have a great balance in your life with trading. You can trade the markets and make a substantial amount of money to cover your expenditures without having to stay on your trading screens all day. What was your favourite part of the retreat? The dinners… Joking! I enjoyed teaching and mentoring the students; the students received a great amount of knowledge and started to understand that we trade the markets according to the market possibilities. We taught them how to be patient and execute the trades at the right time. What do you think was the most valuable lesson the students learned? The most valuable lesson for our students was showing them that this is not something we just talk about and never do. We demonstrated how you can improve your life through trading, and that everybody can do it. It is a reality and it can be achieved. The retreat was awesome because we bonded with our students. 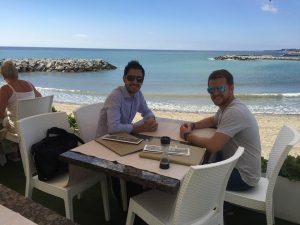 Besides the fact that they became better traders and they learned a lot from Lee and myself, we strengthened as a group of like-minded traders, trading the markets together and enjoying the beautiful city of Marbella and all having a good time at the same time! Thanks Fed for an update on the retreat – wish we could have been there!